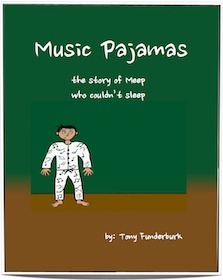 Music Pajamas - a song and one of the many fun ebooks for kids by Tony Funderburk. It’s one of the “Bedtime Buckaroos” bedtime stories. Could a silly pair of pajamas change Meep’s mind about what happened when he closed his eyes? Read the story and look at the pictures to discover the secret of the music pajamas.